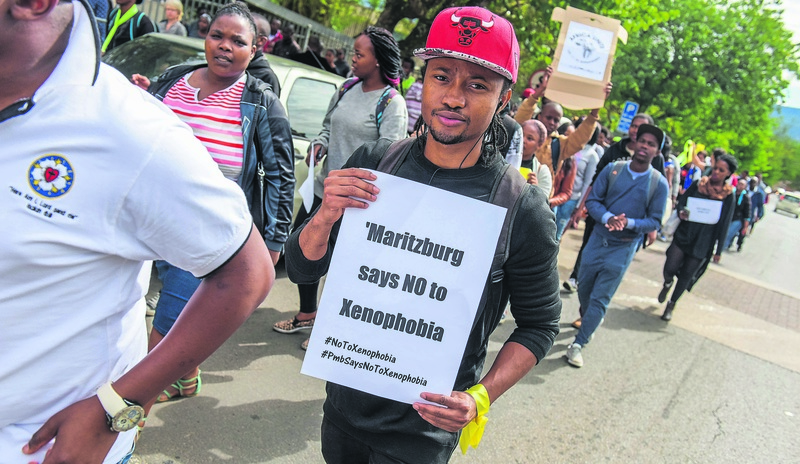 PHOTO: Jonathan Burton Hundreds of UKZN students gathered at the Pietermaritzburg campus on Sunday to rally against xenophobic violence which plagued the city last week. The failure of our government to deliver on the promises of freedom has disabled many young South Africans from competing effectively with their continental counterparts, writes Mamphela Ramphele. South Africa has missed the opportunity to use its attractiveness to migrants as the largest, and now second largest economy as an asset to address its legacy of distorted skills profile and shortages to drive shared prosperity. It's not too late to correct this. Xenophobia is a reality that has been with us since the dawn of our democracy. We need to acknowledge this embarrassing fact and address its root causes. The Mo Ibrahim Forum in Abidjan this past week provided rich data in its Youth and Migration Report to inform the discussions on migration as an age old human phenomenon. It dates back to the very beginning of time when humans migrated from Africa, the mother continent, to populate the rest of the globe. Africa has yet to leverage its youthful population profile (60% of Africa's population is under the age of 25) into a competitive advantage to power inclusive sustainable development. Our governments are yet to follow through with effective implementation of their commitments to invest in talent development through high quality education, health care and social infrastructure. The failure of governance in our own country has resulted in continuing poor education outcomes and growing levels of unemployment, including that of graduates at tertiary levels, leading to the theft of hope. Despair and anger fuel the rage against migrants as scapegoats. Governance failures are also laid bare in the Home Affairs Department that has yet to come up with a migration policy regime that is an essential framework to manage migration as a reality of the human condition and an asset if properly harnessed. The shameful evidence of corruption and human rights abuses at Lindelani that was presented to the Zondo commission as part of the Bosasa state capture saga, is only the tip of the mismanagement of migration. The failure of our government to deliver on the promises of freedom – human dignity, equality of opportunities and hope in a future where the potential of every citizen is unleashed – has disabled many young South Africans from competing effectively with their continental counterparts. Poor communities everywhere in our country find themselves competing for limited socio-economic opportunities with migrants who tend to be the most innovative, determined and resilient people able to tough it out until they succeed. In addition, many of these migrants, especially Somalis, Ethiopians and Nigerians, have learnt to club together to enhance their potential for success through collaboration. Poor people in marginalised communities who have lost the capacity to collaborate with one another due to the daily grind of survival, stand no chance against this competitive onslaught as they see it. Xenophobic violence becomes inevitable under such circumstances. The government has to own this problem and stop pretending it's an aberration driven by criminals. For as long as poor people live in unplanned or poorly planned human settlements with high unemployment that undermine their dignity and sense of hope, for that long will xenophobia persist. There is a huge opportunity to leverage migration to help us reimagine and rebuild our country after two decades of under-performance and state capture. Eskom and other state-owned enterprises that have lost invaluable skills over the last decade, should advertise globally for young Africans to come home and help us rebuild. Why should Canada, USA and Europe benefit from the skills of the African diaspora and we don't? Home Affairs must be overhauled to become a major enabler of inward migration skills from the African diaspora. We also need Home Affairs to serve local citizens better by cleaning out corruption and incompetence that has prevented us from registering every child so we can provide for them from the first 1 000 days to careers and beyond. This would ensure effective development of every citizen into a well informed and critical thinking active citizens who become effective guardians of our democracy from would be capturers. We need to overhaul our education system into one that is anchored on Africa's rich heritage as the cradle of not only humanity but civilisation. We need to ensure that every child is taught in their mother tongue and every South African learn at least one African language to enable an appreciation of the beauty of African culture, values and ethics. Claiming their African heritage would build their self-confidence and self-worth and respect for others especially those who look like them from whom they tend to be alienated. This is the best antidote to the targeting of African migrants by indigenous citizens who are threatened by successful African migrants who outcompete them. We need greater attention paid to land restitution, reform and quality sustained financial and technical support for communities to engage in profitable agriculture and agro-processing as part of rejuvenating and strengthening rural economies. Africa has more than 60% of remaining arable land in the world. We should lay claim to becoming the world's food basket and ensure food security for all citizens. The demand for renewable energy sources is a huge opportunity to engage young rural people so they can live and work in dignity, instead of being thrust into dehumanising shack lands. Again Africa is blessed with sun, wind and oceans that are the essential resources for the growing demand for renewables. We should learn from Morocco that is now self-sufficient in renewables and ready to export surpluses to Europe. Xenophobia will only become history when our governments, starting here at home, rededicate themselves to being leaders who serve their principals – the citizens of Africa. Restoring the dignity of citizens as owners of the state would restore their Ubuntu values and see others as they would like to be seen. Good governance is essential to rooting out xenophobia.